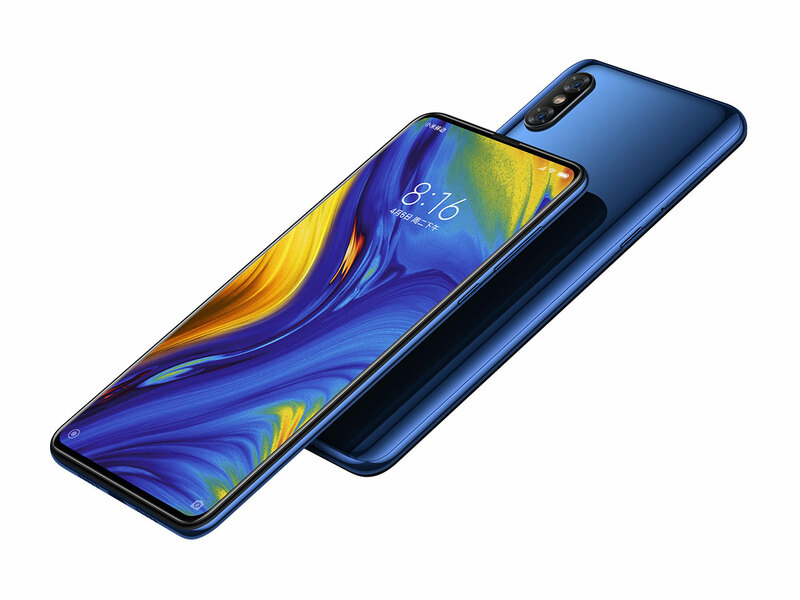 Chinese manufacturer Xiaomi today announced its new flagship smartphone, the Mi MIX 3. The new device features a 6.4” AMOLED display with Full HD+ resolution and only minimal bezels. 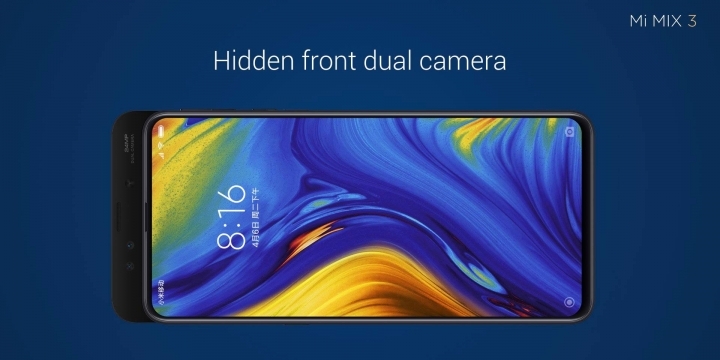 Unlike most current high-end phones, the Xiaomi doesn't come with a display notch. Instead the rear of the phone slides upwards, revealing a front dual-cam setup with 24MP main module and a 2MP depth-sensing camera. major highlighting is sliding camera good one. I saw a Xiaomi 6.4” phone on display in a Xiaomi shop in a shopping mall in Shanghai in September. I’m not sure if it’s the same one but it looked very good. It was tethered to a stand and I was able to handle it but I had no time to find an English speaker to demonstrate it. I also own a Xiaomi MI which I find extremely good. People who make adverse comments about them obviously have no experience with the make. I will definitely buy another if / when I need a replacement. The very best phones come with a notch. Samsung has reportedly found a way to hide the front camera behind the display, without a notch (maybe just a pinhole cutout for the lens). I think that's the future, these pop-out and slide-out selfie cameras are problematic for a lot of reasons. do they all really have to use same/similiar screensaver? I think you can change... Some other popular phones have had customers live with the same GUI-icons for 5 years now, without even the option to change. "... but there are no expansion slot headphone jack." Is it no expansion slot for a MicroSD card, and no headphones jack? Or you just meant no headphones jack? I'm assuming both because the 128/256GB is internal storage, not a MicroSD card. If that is the case (no MicroSD card slot), then this is a deal stopper. When will phone manufacturers understand that a MicroSD slot is a must for many people? I could tolerate a missing headphone jack by using wireless/bluetooth headphones, but an SD card is absolutely a must for me. a complete device useable is virtually any scenario has all standard ports and slots present. What the funk is a "tele-camera"? Looks like Xiaomi is using the same 1.4µm Sony sensor than latest Apple iPhones. Wonder if this phone also has the new Broadcom geolocation chip as their Mi 8 (not yet on iPhones), which is a breakthrough in accuracy by using the higher resolution Galileo constellation. GPS deliberately reserves high resolution positioning for NATO military AFAIK, it would be interesting to see if Galileo really performs without reservation for civilian use. As I said, it is already implemented and functioning in the Xiaomi M8 using a Broadcom chip. Do you know that it works as intended for a fact? You were lucky! My first PC had only 512MB RAM and a 360kB Floppy drive, no hard disk. My first computer (acutally that belonged to my older sister) only had 128kB RAM and a 170kB Floppy drive - which we were very prowd of because most other people still used Cassette drives with their C-64 or C-128. My first computer only 48K RAM and 120K Floppy. price is same as MIX3. Why doesn’t someone put a 1 inch sensor in a phone camera and kill all the competition! There is Sony RX100..just stick a nokia 1100 to the bottom and you are good to go. too expensive, too slow, most of all the lens will have to be too big...and it's probably not ideal for computational imaging purposes either plus you still don't get any zoom...unless you put an even bigger lens into the phone...it's not going to happen, multiple smaller sensors are the way forward. "...it's not going to happen, multiple smaller sensors are the way forward." Huawei has already killed the competition. But Competiton today has little to do with the actual sensor or true image quality. It's all about perception and post-processing auto-retouching by the camera app on the phone. Huawei most certainly did not kill the competition, in fact Pixel3's night mode is sizing up to be far superior to Huawei's crappy smearing, are you one of those Huawei trolls from GSMArena under a different handle? That all makes sense, but that said, I would love to at least see phones move more toward 1/2" or 1/1.7" sensors. It makes a pretty big difference in low light situations, and I don't think phones need to be quite as slim as they usually are these days, so there should be room for decent prime lenses at that sensor size. @S Yu ... I don't know of any troll butm you do sound like one :-), if you claim Pixel3 smaller sensor same f-stop lenses have better low-light abilites you are simply confused. Googles image processing is second to none.. But this is all SW and noise-reduction algorithms post-processing is a moving target and could of course be improved by all camera apps. Your constant effort to whitewash Huawei makes it pretty clear. Currently software has already surpassed hardware in terms of importance to image quality from the magnitudes more possibilities and Google's latest multiframe merging algorithm has proven more than sufficient to fill the gap of sensor size. I have no doubt we'll soon come across evidence that its night mode falls behind the PIxel's too. P20 Pro aperture mode does way better than what google can do with respect to their own algorithm based approach. In fact check the sample images of the lady where it appears someone applied gaussian blur and applied layer mask. Blur masks are generally none of my concern, I only care about image quality, but from other samples I've skimmed across I'd say the XS does best. I get the point with the missing headphone jack and I disagree with it, but it's a stretch to say the phone is crippled. Same thing for expandable storage, these phones have 128gb of internal storage. If you have more on your phone you're doing something wrong. wanting more than 128gb and your " doing something wrong " ?? thats an "interesting "point of view .. If you have hundreds of films on your phone, along with discographies of lectures, music and other media content, then good for you I guess. But what do you do if your phone is stolen or damaged? If you've been following along the past few years or so, what you do today is put all that into some sort of cloud storage and stream it from there. Why would you have hundreds of films on your phone? and i very strongly disagree with your contention that 128gb is more than anyone needs...sounds like you have an apple phone? am I correct? Silly Apple introduced that cutout from the screen image as if it was a big deal; now going 'notchless' has become something of a big deal introducing all sorts of complications. C'mon Mi, you do not have to become silly. Accommodate a blooming front camera, all behind a thin black strip at the top ensuring water and dust resistence; nobody will curse you for that, but they do and will for not having a wired earphones slot. Yea, BIG BOO to Xiaomi for abandoning the earphones input! Also, instead of the camera slider I'd prefer a qwerty. Yep querty KB would be nice! WITH a phone jack! what is 2x camera? Ho many mm is lens? This cell phone maker began new marketing tricks with customers, with 2x and 10x lenses... Nobody say which lenses are there and how they work? Are they real sensors inside or maybe they use just a trick - take some areas from one sensor and show us as 2x lens work? that imx363 can be found in blackshark, mi8 + se, .... it is kind of good sensor but xiaomi Camera software is kind of not fit together. cant make the imx363 as powerful as it should. Still no mention of the GH5 firmware update but yet again another article about phones. BTW, this article has nothing to do with your GH5 camera, so why whine about it here? Because the DPR comments are for nonsensical whining and that's what I want to do so I'm doing it. Haha yeah I highly doubt that. If you think a phone can take picture comparable to any camera you're a sensor size loving fool. Phones for any kind of photography is just ridiculous. Also I'm more of a video person so the GH5 is a pretty big deal. It's one of the best cameras for video for less than $2000. I mean it was a pretty big firmware upgrade. If ya want to hear me complain and whine some more, just keep commenting. Because no one cares about your GH5. I want article whenever my phone gets an update. Why doesn't any company remove the selfie camera altogether and put a small screen in the back of the phone? They can even use face unlock this way. Besides, the quality of the selfies will be much better. Water resistance is also possible. Problem solved. The first feature of the "selfie" cameras is for video-calls. Today on free apps like FB you can make a video conference with a few people at once... surely a small display will not fit the bill. Also the 1-2 camera modules are very cheap and do not add much issues (other than the current notch madness anyway). Having a secondary screen is more problematic from both hardware and software points of view. Video Calls? : You don't need high definition for them. Few people at once: Why do I ever wanna do that! Camera being cheap? : Does the price even matter in this class of phones? Problematic? : Is it really Insoluble ? Is it harder than the other tech problems? @Pooya - a lot of people use video calls and video conferences in a phone, me included. And very rare i take a selfie. Anyway my point is that this is the reason why selfie camera exists in the first place. For example that is their purpose on laptops, tablets ... or did you thought that the camera on a laptop was for selfies? Problematic and insoluble are very different things. But i guess you knew that and was just trying to looks smart, so there so no point in going into further details. No expansion and no headphone jack. No sale. Does it at least have a decent ip-rating? Not that it matters any more. Another one to be chalked up on that nasty list of 'unknown focal lengths', aka 'lazy ignorant/arrogant manufacturers'. I will assume Xiaomi didn't mention it, and I am not asking for reviewers/editors to calculate things, even if physical focal length (not 35mm equivalent) is known. But you guys could at least make a strong point about such ignorant/arrogant manufacturers, offending our intelligence. Mind you: this is a *photography* website, not a *smartphone* website. Accepting this grave hiatus as a reviewer/editor here, on this website, without a single comment, is an even worse offense to our intelligence than the ignorance & arrogance of the manufacturer itself. Oh, mechanics for every time you want to unlock the device? Hope they last a long time then! This is an experimental phone, rather than a flagship phone. They made it in order to test in real environment how will the slide camera work. dahell is wrong with these people? just add a damn headphone jack. all this tech they put in for the camera and screen, but a simple headphone jack isnt included. I have tons of wired headphones. Same here. My next phone will likely be yet another Samsung. The LDAC bluetooth are taking over. Sony's wireless headphones are definitely worth a buy and lack of headphone jack is just happening. Acceptance. Having said that, samsung has more things on the phone than any other company and that makes the Note 9 or A7 or A9 one of the best phones vs features. Also as soon as you have tried pairing two bt units you begin to seriously appreciate cabled connections. It just never seems to work. Your friend wants to borrow your phone with his own headphones? You want to use your headphones with another phone? Good luck getting them to work with your phone again. Perhaps I've been unlucky but all my experience with bt speakers and headphones have been frustrating to the point of screaming expletives at the units. No thanks. Looks nice. But I will not buy it, even though I am using Xiaomi Phones. No phone jack = I am not interested. Besides, I've had a MIX1 phone. It was nice but I don't want to have another flagship phone. I WANT to have a micro SD card for my own data, I greatly disliked having it all on internal memory. And I DON'T WANT a flagship processor - it consumes extra energy and basically gives you power that is not needed for anything. So I will stay on a much better balanced for me phone - Xiaomi MAX 3. That's why Xiaomi's got a whole slew of phones (about a dozen) for you to choose from. Xiaomi's strategy is that there must be one that will fit your need/want. And its prices are very competitive. Yep that's why I am using them. "flagship" processors have 8 cores, half of them are sleeping when not needed in order to save power. And yet they emit much more heat then mid ranged one (I have QC 636 now, it's cold almost all the time) on simple tasks. 64Gb main memory is no longer sufficient. Many apps can't be installed on SD memory so this auxiliary storage is only of use for files such as pictures, videos, music, etc. For 2018 and beyond, I, therefore, recommend at least 128 Gb main memory. @pro photo 2011 - If you store your pictures, videos and music on the SD card you'll have a hard time filling up 64 GB of the main memory. In fact, if you don't use your phone for gaming (I only use my PC for that) you'll be hard pressed to even fill 32 GB. @pro photo 2011, I have a phone FULLY packed with apps AND games (6 games exactly, I need them for work purposes, I am a game designer). All that fill just about 30Gb of internal space. So 34Gb stays available there. All mt data is kept on a MicroSD (movies, pictures, music, books, e.t.c.). So 64Gb is enough. As well as 4Gb of RAM (I have 2.4 of them free all the time). So 10G Ram and 256G internal disk is just a showoff. the 32gb 7model absolutely demands explanation ! I don't play games on the phone and so I don't need flagship power. When you have so many apps (about 8 pages) and they are beginning to fill up available space, you are going to regret not having bought a larger capacity phone. You'll be constantly reminded that the phone is running out of space and you need to delete some apps and cleanup. When nearing full, things get weird; for example, a 38Mb app tells you that it needs 409Mb of space to install. So I have to contemplate whether to delete 400Mb worth of apps just to install a new app. It's very frustrating. So I'll just get a lower-tier phone with medium CPU power, but I want at least 128Gb of internal memory. BTW, I recently bought a 10.5-inch Samsung Galaxy Tab S4 with 256Gb of main memory. It still has an SD card slot for files. I don't buy Apple stuff anymore because there are many alternatives that have much higher cost/performance ratio. @pro photo 2011 - you'll only see such messages if you store your pictures, videos and music in the main memory. If you use an SD card for these, you won't get anywhere close to 64 GB, not even with 8 pages of apps. I have 9 pages of apps in my Samsung Note 8, and they consume 20.8 GB. I'll need about 27 pages of apps to get to 64 GB, which obviously isn't going to happen in this life. Now please remove the selfie camera. Future generations will be grateful. It's a commodity and people need it for long distance video calls. But you could reduce it to FullHD resolution that I wouldn't mind one bit.